There’s a new kid on the yoghurt block. It’s a dairy free, gluten-free, soy-free, lactose-free, no added sugar coconut milk yoghurt. 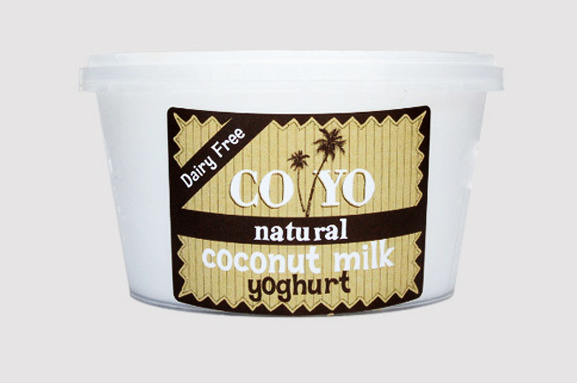 CO YO coconut milk yoghurt is a creamy yoghurt made using xylitol instead of sugar, and coconut milk instead of soy or dairy. Developed by Henry Gosling and produced in a “boutique factory environment” on the Sunshine Coast, this yoghurt is the brainchild of a man who grew up in Fiji. As a young boy it was his job to scrape mature coconuts for the flesh then squeeze the milk from these for use in the family meals. Henry‘s not scraping coconuts any more. The CO YO story started two years ago when Henry woke at 2am with a brilliant idea. He took over the family kitchen for the next six months experimenting with recipes to come up with a yoghurt made from coconut milk that tasted divine. Moving out from the kitchen, he leased a yoghurt -making plant from a local dairy farmer and made his first large batch of 500kg.The milk used in the CO YO yoghurt is now imported in bulk from Indonesia. CO YO coconut milk yoghurt is a new thing. Don‘t expect it to taste like cow‘s milk yoghurt. The unique creamy texture has been described as ―heaven in a mouthful. But as with anything, it is all up to individual taste. The Co-op stocks both the 250g and the 400g containers.